I began a story last year in a flurry of excitement. I finished chapter 10 or 11, and the going got tough. After writing approximately 30,000 words, I started to wonder, “Is this really good? Am I wasting my time?” It was the “make or break” phase. My fear of commitment kicked in. I thought, “What if I invest in these characters, fall in love with them, and find out they aren’t who I think they are?” Weird? Maybe, but that’s how I tick. So, what did I do? I hung it up. Left it. Left my characters dangling. I don’t want to admit to you how many characters I do this to. It’s painful. And I hate to quit. So I told myself, “You are going to finish this, even if it’s bad!” I wanted to commit to the project, to put my heart into it, but I couldn’t. I needed to know my characters were lovable, relatable. I needed feedback to continue. Where could I find that? Where could I find an audience who would only pay attention to the story? If it was good, I’d know it by the following it garnered. This is where I cracked. I gave up the dream of professionally publishing the book. I changed the story up a bit and posted it on Fanfiction, knowing I was giving it away for free. Why? Isn’t that like shooting myself in the foot? Ah, my friend, a free book is better than no book at all. I’m deep in my latest obsession, The Kiss of the Gobboling King. It’s one of those fairytale-revisited works. It’s fun. It’s freeing. No requirements. No target audience. It’s already found a little following. Readers tell me they like Esda and Draill, so I feel safe that these characters won’t disappoint me. I can love them unreservedly. I can finish the story. Is it written the way I imagined it, shined and polished for the bookstore shelf? No. It’s a first draft. But when I’m finished, it will be the entire first draft. That’s what matters. Author Rilla ZPosted on November 17, 2014 November 15, 2014 Categories Inspired by Bloggers, novel writing, Writing RantsTags Fanfiction, fear of commitment, getting feedback, novel writing, word count, writer woes, Writers ResourcesLeave a comment on Save the Dangling Characters! It’s November, which means my mind is on food again. I thought I’d share with you a couple of my current fall recipes to season the season. I posted my Stone Soup recipe, which is a favorite year-round, but this time I thought I’d give you a meat-less soup to try. Realm rarely lets me get by with a meat-less soup, or any soup that doesn’t end in “ili” and start with “ch.” The secret to getting your meat-loving husband to eat soup is to serve it with something that contains a little bit of meat. That’s where a hearty bread spread comes to the rescue. Yes, another one of my fabulous photos. You can’t get enough, I know. I used homemade flatbread instead of a store-bought loaf. That’s good, too. For gluten-free folks, you can top rice cakes with the spread and toast them in the oven, too. They come out crispy-browned on top and very, very flavorful. Your tummy will totally appreciate this! 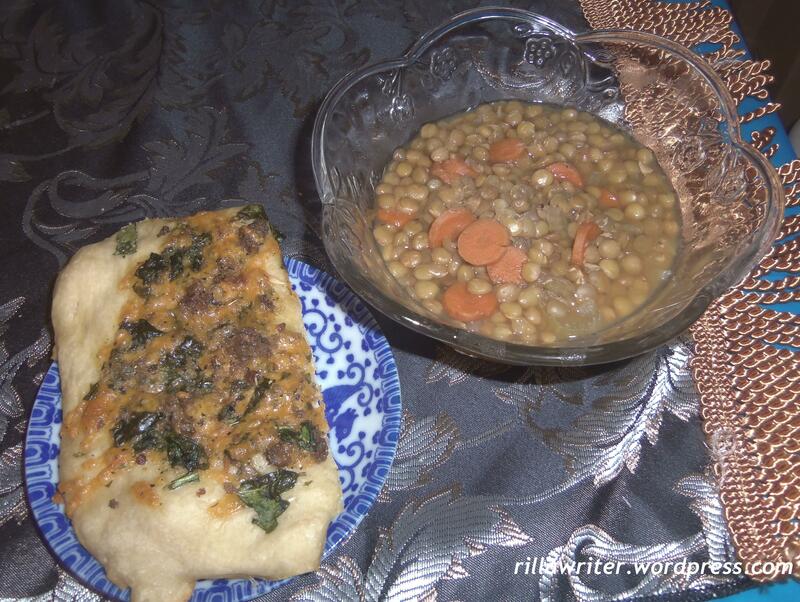 Author Rilla ZPosted on November 5, 2014 November 3, 2014 Categories Food for ThoughtTags fall recipes, Food, lentil soup, spread recipe for Italian bread, warm soup5 Comments on A Warm, Toasty Treat!